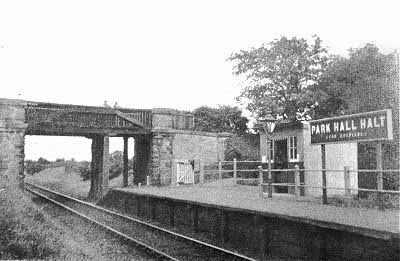 Notes: Park Hall Halt was located on the 2½-mile Gobowen – Oswestry branch of the Great Western Railway (GWR) which was originally opened by the Shrewsbury & Chester Railway (S&CR) on 23 December 1848. The branch connected to the S&CR main line that linked Shrewsbury and Chester and which following take-over by the GWR on 1 September 1854 became part of a major trunk route between the Midlands and the River Mersey at Birkenhead. At the time of opening there were no intermediate stations on the branch. During the Great War a field hospital was developed to the east of the line, south of Gobowen. In 1921 the facility was developed as the Shropshire Orthopaedic Hospital and on 5 July 1926 the GWR opened Park Hall Halt to serve it. 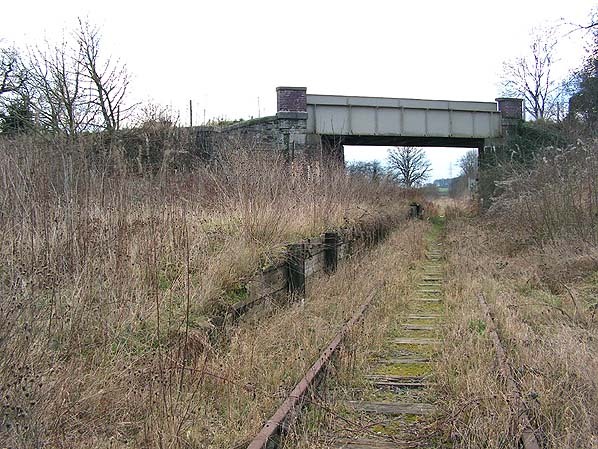 The halt was located on the east side of the line, south of a minor road that passed over the line by means of a bridge. Just to the west was the Oswestry – Gobowen road (A483). The hospital was on the north side of the minor road to the east of the halt. At the time of opening the halt had a short platform and a simple, corrugated iron pent-roof waiting shelter (as seen in the photo above). It had a large nameboard which read ‘Park Hall Halt for Hospital’. There was also an oil lamp. The halt was served by auto-trains and rail-motors that mostly operated as a shuttle service between Gobowen and Oswestry although there were some through workings to and from Ruabon and Wrexham General. There was an intensive service of 22 trains in each direction. During the Second World War the hospital was very busy, and to facilitate the increased number of passengers the halt was improved. The platform was extended northwards so that it passed under the bridge. To facilitate this, a new bridge span was installed. The station nameboard was moved to the north side of the bridge on the new section of platform. A new building was provided to the north of the original waiting shelter. It was a corrugated iron shed with a pitched roof and a flat timber canopy. On 1 January 1948 Park Hall Halt became part of British Railways [Western Region] (BR[WR]). The BR[WR] timetable for the summer of 1949 (shown above) showed 21 trains to Gobowen and 25 to Oswestry on Monday-to-Friday. On Saturday there were two extra trains in each direction and there were ten trains each way on Sunday. The winter timetable published on 15 September 1958 showed 23 trains in each direction on Monday-to-Saturday. On Sunday there were six trains to Gobowen and seven to Oswestry. A further five services in each direction were shown in the timetable but they were by buses of the Crosville Motor Company. 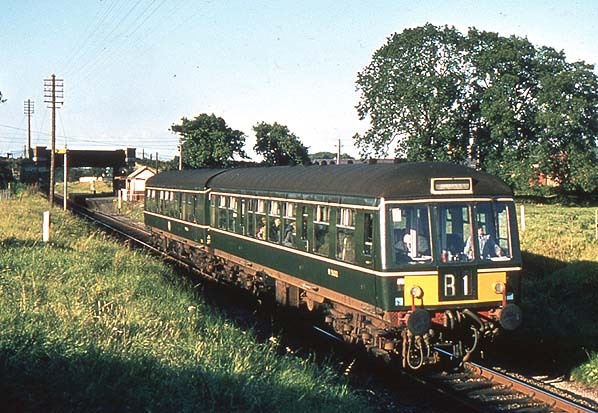 In the early 1960s diesel multiple units were introduced onto the line. On 1 January 1963 the branch was transferred to the control of British Railways [London Midland Region] (BR[LMR]). No reference to the Gobowen-Oswestry service was made in the Reshaping of British Railways of 1963 (the ‘Beeching Report’) and, confusingly, the accompanying Map 9 of the report omitted the line altogether. 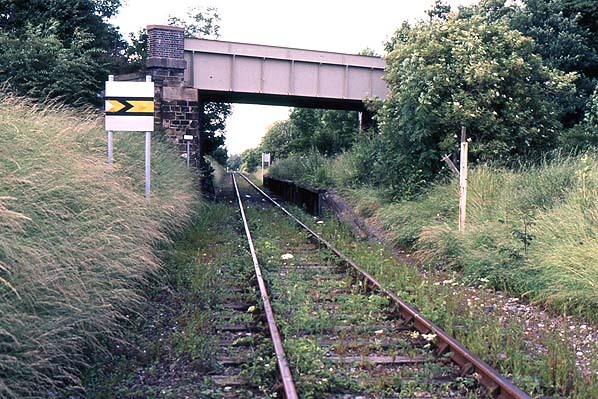 The other route through Oswestry (Whitchurch to Welshpool) was recommended for closure to passengers, and this took place on 18 January 1965 leaving the Gobowen-Oswestry line as a branch as far as passenger services were concerned. The BR[LMR] winter timetable published on 7 September 1964 still showed an intense service of 21 trains in each direction Monday-to-Saturday although the Sunday service had ceased. However, it was not long before the proposal to close Gobowen-Oswestry was made affecting Park Hall Halt and Oswestry station, and this was published on 25 August 1965. The hearing of objections concluded on 27 January 1966, and on 7 July the Minister of Transport, Barbara Castle, approved the closure of the line. 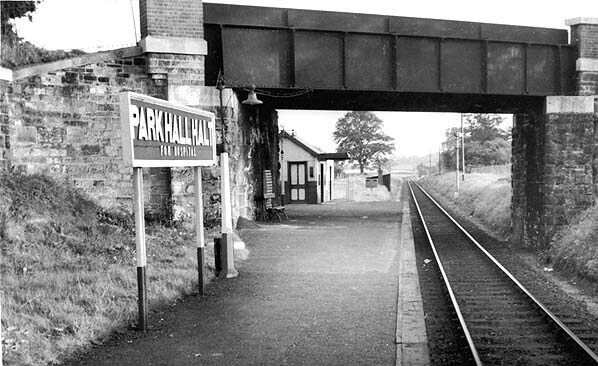 The service continued to run until Saturday 5 November 1966 and Park Hall Halt was closed completely, and Oswestry to passengers, on 7 November 1966. The line remained in use for general goods services until December 1971 after which its only traffic was the Blodwel Quarry trains. The Second World War station building survived until the mid 1970s. 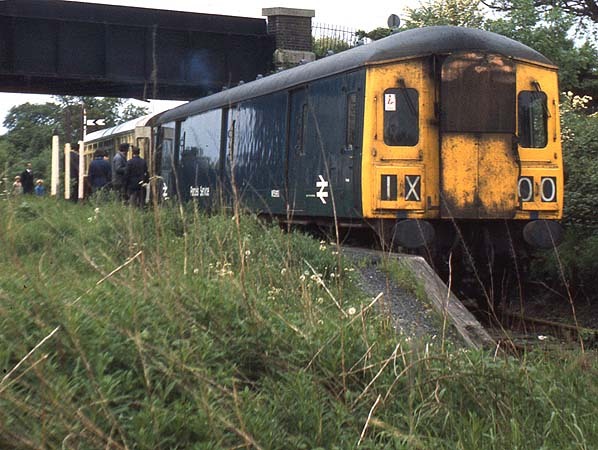 On 30 May 1976 a passenger train called at the halt in the form of a rail tour. It was probably the last time passengers ever alighted here. The Blodwel Quarry trains ceased in 1988 and the line was mothballed. 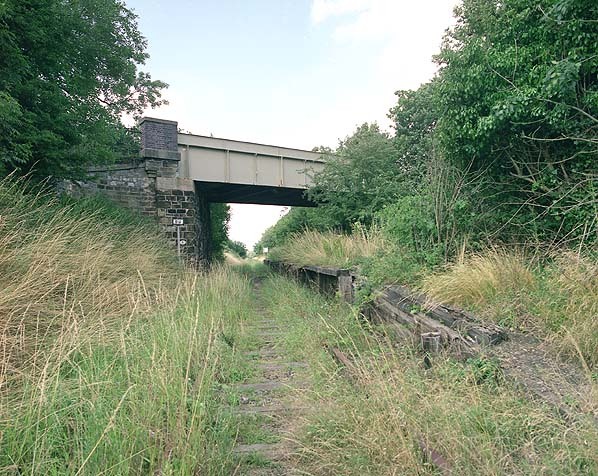 In 2016 vegetation had been cleared from the track as part of a plan to reintroduce trains between Gobowen and Oswestry as part of a heritage railway. The platform at Park Lane Halt was extant at this time. Great Western Halts - Volume 2 - Kevin Robertson - KRB Publications 2002. Paddington to the Mersey - Dr R. Preston Hendry & R. Powell Hendry - Oxford Publishing Company 1992. 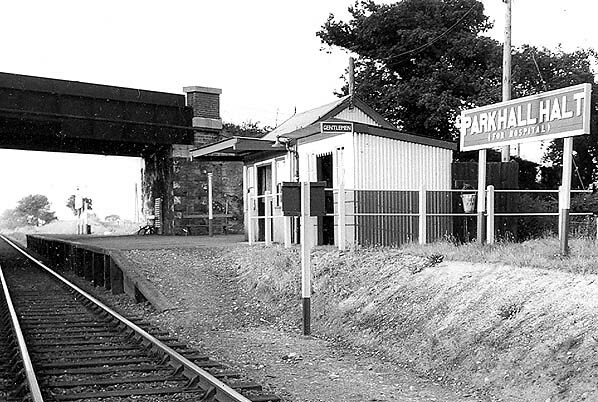 Park Hall Halt looking south in the late 1950s. Park Hall Halt shown on a six-inch scale map from the 1940s. Park Hall Halt looking north in the 1950s. Looking north towards Park Hall Halt in the mid 1960s. The halt can be seen behind the two-car Derby-built diesel multiple unit that is heading to Oswestry. The service appears to be well used. A view looking south at Park Hall Halt in January 1974. On 30 May 1976 a rail tour visited Park Hall Halt. In this view the tour is seen standing at the platform on its northbound leg to Gobowen. The tour had unusual motive power in the form of a Chester-based parcels diesel multiple unit which towed an ex-GWR auto trailer. 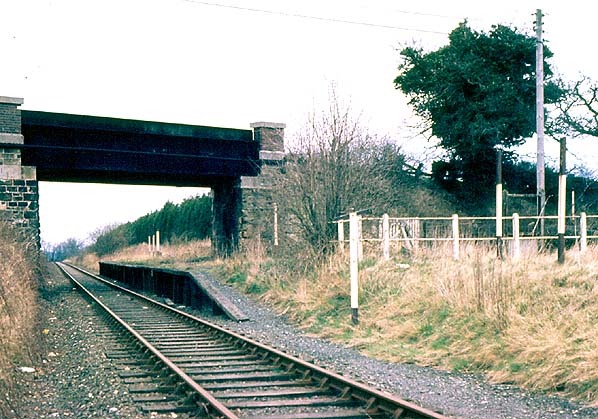 Although the buildings had gone Park Hall Halt was remarkably intact when this view looking north was taken on 24 March 1978. 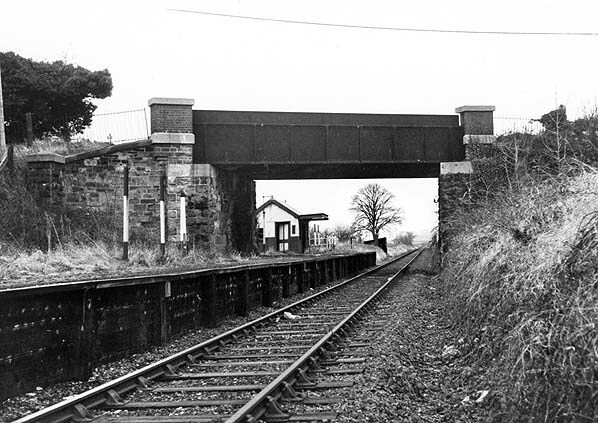 Looking north at Park Hall Halt in the second half of the 1980s. At this time trains were still running between Gobowen and the Blodwel quarry. Park Hall Halt looking north in May 1995 nearly seven years after the line had gone out of use. Park Hall Halt looking south in February 2006.